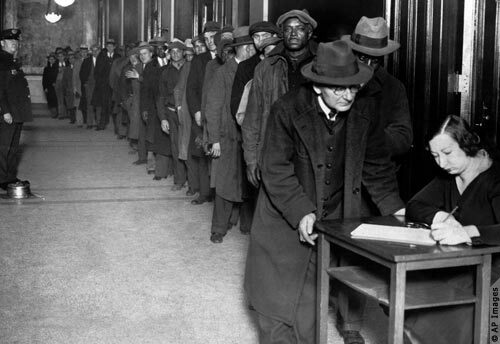 The October 1929 stock market crash signaled the beginning of the Great Depression which would continue until the outbreak of World War II. At its depth, the jobless in New Jersey ranged between a quarter to a third of its workforce, with African American unemployed estimated at over half of workers. New Jersey per capita income fell from $839 in 1929 to $433 in 1933 and some 140 banks closed between 1928 and 1933. Confronted with sharply reduced revenue, the state government cut its budget from $34.5 million in 1931 to $19.7 million in 1933. Municipalities were forced into bankruptcy as their principal source of revenue, the local property tax, plummeted with the decline in real estate prices. The difficult fiscal situations of some cities were exacerbated by the debt which had been incurred during the optimism generated in the 1920s; both Atlantic City and Asbury Park opened new convention halls in 1929 and 1930 and faced the need to pay off their debt through the Depression. Lacking enough cash to pay their bills and their employees, some towns were forced to issue scrip--future promises to pay when they could. The chief executive of New Jersey Bell Telephone volunteered to chair the state's emergency relief board, submitting a report to the Governor in 1933 that recommended providing state funds to assist some 100,000 families unable to pay their rents and facing eviction. In 1932, New York Governor Franklin D. Roosevelt declared his candidacy for president, winning the nomination at the Democratic National Convention in Chicago. Jersey City Mayor Frank Hague had been a supporter of one of Roosevelt's principal opponents, Al Smith, the party's 1928 nominee and former New York governor who had backed Hague's election as vice chairman of the Democratic National Committee. 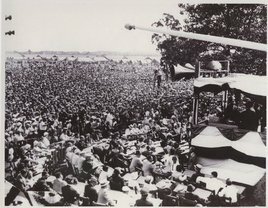 After Roosevelt's nomination, however, Hague quickly demonstrated his shift in loyalty to Roosevelt when he hosted the nominee in a campaign kick-off tour on August 27 through New Jersey culminating in a rally at Sea Girt which drew an estimated 100,000 persons, most of whom were brought by train and bus from Hague's strongholds in North Jersey. Hague's exhibition of his political strength later made him the conduit in the state for implementation of Roosevelt's New Deal policies, which included financing for new hospitals, parks and stadiums and many jobs projects under the Works Progress Administration. 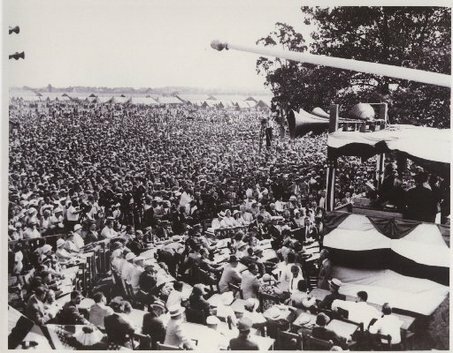 After Roosevelt's nomination, however, Hague quickly demonstrated his shift in loyalty to Roosevelt when he hosted the nominee in a campaign kick-off tour on August 27 through New Jersey culminating in a rally at Sea Girt which drew an estimated 100,000 persons, most of whom were brought by train and bus from Hague's strongholds in North Jersey. Hague's exhibition of his political strength later made him the conduit in the state for implementation of Roosevelt's New Deal policies, which included financing for new hospitals, parks and stadiums and many jobs projects under the Works Progress Administration. In other areas of the state, Roosevelt's Civilian Conservation Corps established nine camps with 1,800 men between the ages of 17 and 25 employed in state forests and parks cutting trees, clearing trails and performing other tasks. 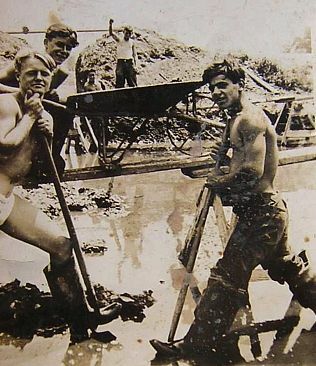 Workers also were offered educational programs and vocational training; nationally, over 40,000 illiterate men were taught to read and write through the CCC. The 1930's also saw the Roosevelt administration's attempts to restore economic health begin to compete with concerns over the deteriorating overseas situation. Refugees from the Nazis began to come to New Jersey, although federal quotas on immigrants to avoid competition for scarce jobs during the Depression prevented many from entering the country. 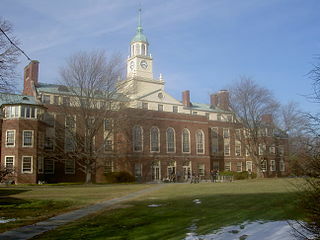 In 1930, The Institute for Advanced Study was founded in Princeton, with financial support from Newark retailer Louis Bamberger and his sister Caroline Bamberger Fuld, as a center for theoretical research and to provide a haven for Jewish scientists fleeing the Nazis. Three years later, Albert Einstein emigrated to join the Institute's permanent faculty, and in 1939 Einstein wrote a letter to Roosevelt advising him of research which could lead to development of an atomic bomb. Like other areas of the country, New Jersey also included groups openly sympathetic to the anti-Semitic campaign of the Nazis. The German American Bund, an organization promoted by Hitler, maintained several chapters in the state and built Camp Nordland, a 200-acre retreat in Andover Township where it held rallies drawing crowds up to 10,000 and conducted youth training programs. The radio program of Father Edward Coughlin, a Catholic priest who attacked Jews and the Roosevelt policies, continued to be broadcast by a Newark radio station long after most other stations had cancelled Coughlin's program. Apart from the economy and the deteriorating situation in Europe, the 1930s also saw a series of diverse events which brought national attention to New Jersey. 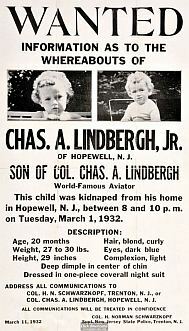 On March 1, 1932, Charles A. Lindbergh, Jr., the 20-month old son of Anne and the famed aviator Charles Lindbergh Sr., was kidnapped from the second-floor bedroom of the Lindbergh home in East Amwell. After an extensive search in which the senior Lindbergh and Herman Norman Schwarzkopf, the superintendent of the New Jersey State Police, took leading personal roles, the child's body was found in woods in Hopewell Township about 4.5 miles south of the Lindbergh home, with his death attributed to a skull fracture. In 1935, after his conviction in "the trial of the century" held at the Hunterdon County Court House in Hopewell, Bruno Richard Hauptmann, a German immigrant living in the Bronx, was executed for the child's death. In 1934, the passenger liner Morro Castle, sailing to New York City from Havana, caught fire on September 8 off the New Jersey coast, resulting in 137 deaths of passengers and crew. The ship later came aground off the Convention Hall in Asbury Park, remaining there for six months and attracting thousands to view the ship before the hulk was towed away and scrapped. The cause of the fire was never `determined. On October 30, 1938, director and actor Orson Welles broadcasts the radio play War of the Worlds describing a landing of Martians in Grovers Mill in West Windsor, which produces panic among those believing it is an account of a real event. In 1937, the German airship Hindenburg is consumed by fire as it hovers to land on May 6 at the Lakehurst Naval Air Station in Ocean County. Thirty-six people die (13 passengers; 22 crew; and one ground worker). The trip from Germany was intended to be the first of ten round trips between Europe and the United States that were scheduled for the ship's second year of commercial service.